411 Wrestling Hall of Fame Class of 2012: Vince McMahon Sr.
Today, World Wrestling Entertainment is a global juggernaut, a publicly traded corporation routinely averaging almost a half a billion dollars in yearly revenue. WWE programming is translated into 30 languages throughout 145 countries with offices located across three continents. WWE did not start at that level, and it took more than three decades before the man we know today as Vince Kennedy McMahon was in charge. WWE was born as Capitol Wrestling out of Washington D.C., both promoter and booker was Vincent McMahon Sr.
Vincent James McMahon was born in 1914 and with his older brother Roderick Jr. and younger sister Dorothy, were second-generation Americans. Their grandparents arrived in New York City by way of Ireland in the late 19th century. Vince spent a lot of time as a boy in the old Madison Square Garden, where his father Roderick “Jess” McMahon worked as a booker for Tex Rickard, the big boxing promoter of the time. As a young adult, with his father, they opened up an office in Long Island where they promoted concerts and fights until the Second World War broke out. During the war, he served in the U.S. Coast Guard. It was then in 1945 that he left his first wife, Victoria Askew with their two boys Roderick II and an infant Vincent in North Carolina. He set up shop in Washington D.C. and took control of the 2,000-seat Turner’s Arena where he promoted Capitol Wrestling. Through 1955, the product out of that arena was based exclusively on live events and featured outside stars like Gorgeous George, Hans Schmidt and Antonio Rocca. McMahon realized he needed his own television for business to pick up, a conclusion that continues to drive the modern day professional wrestling industry. With the Turner’s Arena modified into the Capitol Arena, January 1956 saw the launch of McMahon’s first weekly TV on the local DuMont network. It was not an immediate ticket to print money because he was forced to pay production costs early on out of his own pocket and was fending off a rival-wrestling group in D.C. Before too long, that competitor jumped into business with McMahon and live gates increased thanks to television. The four generations of men in the McMahon family to enter the professional wrestling business. From left to right, Roderick “Jess” McMahon, Vincent James McMahon, Vincent Kennedy McMahon and Shane McMahon. Months later in June, an opening presented itself and McMahon’s wrestling was chosen to move to DuMont’s WABD station out of New York City. With associates Toots Mondt and Willie Gilzenberg the trio took over Madison Square Garden rather quickly as their show in February 1957 drew the largest house in decades. The plan was to control not just Washington and New York, but as much of the east coast as they could. Vince entered into contracts with wrestlers, among them, like Antonio Rocca who received consistent work in his areas. The Capitol Wrestling Corporation would go on to take firm control of the northeast territory and struck gold catering to the different ethnic groups around the region. Whether it was Argentina Rocca or Miguel Perez, thousands of fans paid to see their favorites claim victory. Madison Square Garden records for live attendance and live gate were broken several times between 1958 and 1959 based mostly on Rocca teaming with Perez to fight an assortment of villains (the Fabulous Kangaroos, the Hamilton Brothers and one particular team which featured a younger Vince McMahon’s favorite wrestler, Dr. Jerry Graham and his brother, Eddie). It was not until 1957, when Vincent K. McMahon was 12-years old that he met his father for the first time. Growing up in a North Carolina trailer park, Vince had only heard stories about his New York businessman of a father. Although early on in their relationship, the elder McMahon. hated the idea of his son getting into the wrestling business and over time that feeling would dissipate (though he never agreed to let his son become an active part of the action). After picking up a third television outlet out of Connecticut, which meant if you lived as north as Maine or as south as the District of Columbia, you watched Vince’s Capitol Wrestling. The Connecticut show also infiltrated Chicago in the fall of 1959 and Capitol would loan its wrestlers to groups in those areas, taking back a cut of each show. At various times, there would be talent from New York working in Toronto or Detroit, New England or Virginia and practically every place in between. Live business picked up again in 1960 with the return of Nature Boy Buddy Rogers from Montreal. Opposite Rocca, the pair immediately drew 18,000 fans at MSG. Around this time, McMahon joined the National Wrestling Alliance and after Rogers was given their United States heavyweight belt, he continued doing good business not just for McMahon but for affiliates he visited on tour. McMahon wanted Nature Boy to get a run as the NWA heavyweight champion, which to other members didn’t seem like a bad idea because he was good for business. Of course, it was assumed that his dates would not be monopolized by his home territory in New York. June 1961 saw nearly 40,000 fans take over Comisky Park in Chicago to witness Buddy Rogers dethrone NWA champion Pat O’Connor (that attendance record stood for over 20 years until Kerry Von Erich challenged Ric Flair in Texas on the memorial show for his brother David). Many Alliance members’ worst thoughts were realized over time because instead of one of the top NWA officials controlling the champion’s schedule, that duty fell upon Vince McMahon. About half of the NWA-affiliated territories didn’t even receive a single appearance from the champion while the northeast dominated the Nature Boy’s schedule and a minority of other locations like St. Louis (former NWA President and active executive secretary at the time, Sam Muchnick) and Chicago (NWA President Fred Kohler) would the majority of non-McMahon dates. In late-1962, although business was doing well for McMahon, there was a movement within the NWA to move on from Rogers and back to their old stable kingpin, Lou Thesz. Buddy was hesitant to give it up, but the NWA voted in favor of Thesz. The time came in January 1963 and with his $25,000 deposit hanging in the wind, he decided to cooperate and lose. At this point, McMahon made the decision to break away from the NWA heavyweight championship and push his own main event champion (a no-no for NWA affiliates). Quite simply, all of McMahon’s television ignored the reality of the situation and started fresh. Capitol Wrestling morphed into the World Wide Wrestling Federation (WWWF) and they promoted Buddy Rogers as their first champion after he “won” a tournament in Brazil. Unfortunately, he suffered what was believed to be a heart attack in the spring and whether or not this was cover to save face or legitimate, he ended up dropping the championship to McMahon’s new golden boy, Bruno Sammartino. Bruno began his historic over seven-year-long WWWF championship reign in May 1963 after a 48-second match with Rogers. Ironically, McMahon maintained connections with the NWA (with the exception of recognizing their champion) and relationships with the other members. Meanwhile, WWWF business improved from previous periods with Argentina Rocca and Buddy Rogers on the back of Italy’s own Sammartino. 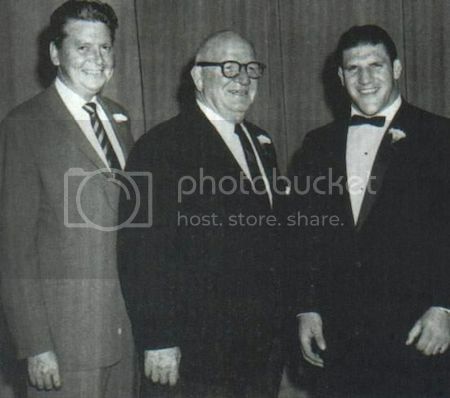 From 1964, Vince McMahon Sr. with partner Toots Mondt and WWWF champion Bruno Sammartino. To give you an idea of the presence Vince’s brand of wrestling had in the northeast, in 1965, the old Capitol Arena in Washington D.C. was demolished. A coinciding Washington Post story mentioned how General Douglas MacArthur and First Lady Bess Truman were two big fans of out of the area years earlier. The new Madison Square Garden opened in 1968 but by 1971, Sammartino wanted a break and with concerns of overexposure, the championship moved to Ivan Koloff. In keeping with the McMahon philosophy, the belt changed hands three weeks later to the popular Pedro Morales. Speaking of popular, it was Vince McMahon Sr. who realized what to do when a giant landed in his life. A Frenchman going by the name Jean Ferre was introduced to McMahon in 1973. After renaming him “Andre the Giant,” he was sent around the circuit between the WWWF and the rest of the NWA territories around the country. The idea was that if Andre was in any one region for too long, his drawing power would suffer. It wasn’t too long before Andre became the biggest star in the business breaking through to mainstream culture. 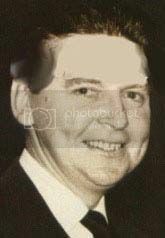 In 1969, after graduating from college and working as a salesman, Vincent Kennedy McMahon. debuted on WWWF television as a ring announcer because the usual employee wanted better pay. Later on, insistent that his son pay his own dues, Vincent was given the chance to promote wrestling in Maine. The early 1970s saw Madison Square Garden shows remain successful and the introduction to wrestling at Shea Stadium in Queens, New York. Morales’ run with the gold ended in 1973 and after a handful of days Stan Stasiak spent as champion, Bruno Sammartino returned to the top for another run that lasted nearly four years. The big Showdown at Shea card in 1976 was headlined by a championship match between Sammartino and the man who broke his neck, Stan Hansen (they drew over 30,000 fans). Four years later, Sammartino was a top figure on the final Shea show which drew over 36,000 people (and set a live gate record of over $530,000), when he fought his rival Larry Zbysko. To this day, Sammartino is the most successful pro wrestling draw in the history of Madison Square Garden, having sold out 89% of the 211 shows he headlined. By 1979, Vincent McMahon struck a deal to lease Cape Cod Coliseum with all kinds of acts including a variety of sports and concerts, while maintaining his role on WWWF television. Although there were plenty of people in the wrestling business who looked at him as nothing more than the promoters son, he was slowly but surely being educated on how to run the wrestling business. For the first time in its decade-plus history, Vince’s WWWF bucked the trend of short heel title reigns and prolonged baby face runs with Superstar Billy Graham. The fast-talking, tanned muscle-bound wrestler was the man who defeated Sammartino in April 1977 in Baltimore. Graham was a good draw on top but ultimately, his run was cut short after nine months. In an interview on the Superstar Billy Graham DVD released by WWE years ago, Vincent Kennedy McMahon spoke about how his father wanted Bob Backlund on top and in his opinion, cut Graham’s reign too short. The switch happened in February 1978, beginning a nearly-six-year run. While Backlund was not the type of draw as past ethnic champions like Sammartino or Morales, he was not considered a failure (obviously, he wouldn’t have been champion for over five years if he was). To improve their marketing, the decision was made before the summer of 1979 to change the name of the promotion from WWWF to the World Wrestling Federation (WWF). The time finally came in the summer of 1982 when the transition from father to son came to fruition. The WWF’s parent company, Capitol Wrestling saw its group of owners sell their stock to Vincent K. McMahon for approximately $1 million. At a New York City hotel, the deal between father (and partners) and son was completed. Robert Marella (Gorilla Monsoon) and Arnold Skaaland sold their shares for a salary of one and a half times an average wrestler’s pay over each show promoted by the new boss. Phil Zacko, the Capitol treasurer, and Vince Sr. would receive monthly payments for two years. The parting McMahon made sure a provision in the contract stated that should his son fall back and miss a single payment, their contract would be voided. Shortly thereafter, Vincent Kennedy McMahon flipped the wrestling business on its head as he proceeded to do what his father did not – put every competitor out of business. Bob Backlund, the last champion booked by his father, lasted until the end of 1983 at which point the move towards Hulkamania began. After selling the company he built, Vince Sr. settled into his Florida home. He passed away in May 1984 after a battle with pancreatic cancer. He was posthumously inducted into what is now known as the Madison Square Garden Walk of Fame by his son, who himself was later inducted in 2003. No one could have imagined the success that would come to both the World Wrestling Federation and the entire industry as a whole in the decades following McMahon’s death. The old story goes that before his son purchased the company, for years Vince insisted to his peers around the country that he would not compete nationally. Almost immediately after assuming control, Vincent Kennedy McMahon did just that under the guise that it was part of the natural evolution of professional wrestling. While many men have come and gone claiming the current day promoter to be nothing but a snake oil salesmen, the vast majority of figures from yesteryear always claim Vince Sr. was one of the more honest promoters in the business. You can always debate what would have happened had McMahon not been stricken with cancer and stayed active well into the 1980s. Unfortunately he did not, and what he helped build along with the lessons he helped his son learn, laid the groundwork to what would become one of the most successful and profitable entertainment brands in American history. Bring up the subject of the best professional wrestling promoters of all-time and no list is complete without Vince McMahon Sr. His vision implemented weekly television for the then-WWWF and at one point, sold out Madison Square Garden 21 consecutive times (a mark which has never been duplicated by the company since). McMahon is credited with turning Jean Ferre into “Andre the Giant” in the early-1970s, creating one of the industry’s biggest stars. With future legends like Bruno Sammartino and Superstar Billy Graham, McMahon led one of the most successful wrestling organizations in the country throughout the territorial days. He promoted for just shy of 30 years before passing the baton to his son Vincent Kennedy McMahon and before too long, what was once a regional business out of the northeast United States developed into a global juggernaut.